A meal of salmon is a time-honored Fourth of July tradition in New England, along with peas and new potatoes, which came into season around the same time the fish ran. Times, however, have changed. Atlantic wild salmon is commercially extinct. In May, salmon fishing was banned in California and most of Oregon to halt the rapid disappearance of the species there. Over the past few weeks, the price of Alaskan wild salmon fillets has ranged from a whopping $20 to $35 a pound at local fish markets. And health and ecological concerns regarding the consumption of farmed salmon have been much in the news. For consumers, this adds up to one question: Should we still be eating this favorite fish? Salmon is the third-most-popular seafood in America, behind shrimp and tuna, according to Laura McNaughton, director of the trade association Salmon of the Americas. We've embraced it because it tastes good, and because it's supposed to be good for us, a source of protein that's low in saturated fat and high in heart-healthy omega-3 fatty acids. But in 2004, Science magazine published a study comparing the amount of contaminants such as PCBs and dioxins in farmed vs. wild salmon. Concentrations were "significantly higher" in farmed than wild, researchers found, with European-raised salmon having higher loads than those from North and South America. "Risk analysis indicates that consumption of farmed Atlantic salmon may pose health risks that detract from the beneficial effects of fish consumption," wrote the researchers, who analyzed about 700 farmed and wild salmon collected from around the world. Farm-raised fish accounts for up to 90 percent of the salmon sold in this country. Left to its own devices, this fish would have gray flesh; wild salmon's pink hue is caused by carotenoids that occur naturally in its diet. To make their salmon salmon-colored, farmers feed the fish synthetic versions of these pigments. (One of them, canthaxanthin, has been linked to retinal problems in humans, who take it to turn themselves colors, too; it's used as a tanning pill.) This feed is expensive for farmers, but perhaps not as expensive as going natural would be. Market research shows consumers believe color is an indication of quality and will therefore pay significantly more for pinker salmon. Though synthetic pigments may make salmon look more appealing, they also make it harder to tell the difference between farmed and wild. When Consumer Reports tested out-of-season fish labeled "wild" they found more than half of it was actually farmed; in season, however, the labeling was accurate. Wild salmon starts to show up in markets in May and peters out in October; peak season is from June to September. Farmed salmon can be prone to illness, depending on farming practices. Fish are sometimes overcrowded in net pens, which leads to the rapid spread of disease. Salmon from Chile has recently come under scrutiny, for example, as large numbers of fish die from a virus called infectious salmon anemia. 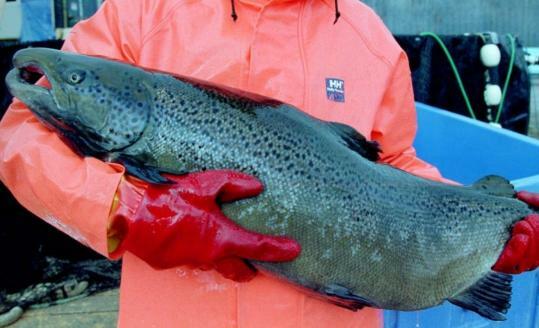 Sick fish can mean treatment with antibiotics; in the past, Chilean salmon have been treated with high levels, raising concerns about antibiotic resistance. Last year, when the FDA blocked the sale of five kinds of farm-raised Chinese seafood, it was in part because they were being treated with antibiotics prohibited for use on food animals in the United States. According to the Pew Environment Group, in 2007 the United States imported 114,320 net tons of salmon from Chile, but the FDA only tested 40 samples. No one at the FDA was available for comment. Overcrowding can also encourage infestations of sea lice, crustaceans that farmers control with a pesticide called emamectin benzoate, or SLICE. "SLICE is a heavy-duty pesticide. It's used to rid trees of pine beetles on land," says Taras Grescoe, author of the recent book "Bottomfeeder: How to Eat Ethically in a World of Vanishing Seafood" as well as a New York Times op-ed last month in which he swore off salmon. "Very quietly last year, Health Canada allowed trace amounts of SLICE to show up in salmon that goes to market. The FDA doesn't test for this. About 40 percent of the salmon in the States comes from Canada." The website of Health Canada, the country's federal health department, states "the public can feel confident that salmon treated with SLICE are safe to eat. Health Canada has set stringent conditions regarding the use of SLICE in order to safeguard the safety and quality of products entering the food chain." McNaughton of Salmon of the Americas refutes concerns over farmed salmon. "There are more PCBs in butter and cattle than farmed salmon," she says. "There are no pesticides and no medicinal residue in any salmon that comes into the US. It's very well regulated by the FDA." The substances that make farmed salmon pink, she says, are not only safe but essential. "It's a vital nutrient to the species." McNaughton cites a 2006 study by the Institute of Medicine of the National Academies that found farmed salmon to be one of the lowest in mercury and highest in omega-3s when compared with a large selection of other seafood. Critics of farmed salmon agree that it is relatively low in mercury. Alice Lichtenstein, professor of nutrition science and policy at Tufts University, says salmon should still be a part of our diet. "The bottom line is, right now you have to look at it in terms of a risk-benefit ratio," she says. Cardiovascular disease is the leading cause of death in the United States. "The risk of developing cardiovascular disease is very high. The risks of salmon are very low. The benefits outweigh the risks." Lichtenstein suggests eating two fish meals per week. "Salmon is a great option," she says. "You get the omega-3 fatty acids associated with decreased risk of cardiovascular events, and you could end up decreasing saturated fat because you're not eating steak or a hamburger." Whether or not farmed salmon is good for us, it hasn't been particularly good for wild salmon. Farmed salmon can spread sea lice to wild ones as they swim past, killing a large percentage of the juveniles. Researchers have predicted this could wipe out wild salmon populations in some Canadian rivers and streams within eight years. Combine that with increasing water temperatures due to global warming and the many dams that impede fish trying to swim upstream, and wild salmon's future looks troubled. Farms can also pollute ocean water. The solution to farm-related problems, says Grescoe, lies in aquaculture reform. "There's a guy in British Columbia raising salmon inland in concrete tanks," he says. Unlike net pens in the ocean, this keeps farmed fish away from wild. "He takes the purified waste and uses it to fertilize fields of wasabi. He's selling these salmon to good restaurants in Vancouver. If chefs start setting an example, then people will pay attention." Some chefs are headed in that direction. At Legal Sea Foods, executive chef Rich Vellante says, both farmed and wild salmon are on the menu. When it comes to farmed, "we put a lot of pressure on the people we buy from. There's a company in British Columbia we've worked closely with for eight years, and we focus on no antibiotics, not overcrowding the pens, staying away from hormones." To aid consumers, several organizations offer online guides to ocean-friendly seafood, among them the New England Aquarium. The aquarium also hosts a Celebrate Seafood dinner series; guest chefs help prepare three-course meals highlighting ecologically sound selections. A dinner scheduled for Oct. 7, with Paul O'Connell of Chez Henri, will feature wild Alaskan salmon, one of the fish the aquarium currently recommends. As for Grescoe, these days he's eating sardines, mackerel, anchovies, and herring. "Those fish are really abundant," he says. "We should be eating things closer to the bottom end of the food chain" - thus the title of his book. Instead, these fish are often used for bait, or turned into feed for pigs, chickens, shrimp, and salmon. "It's a huge waste of protein," Grescoe says. "It takes about four pounds of smaller species to make one pound of salmon." Maybe it's time for a new Fourth of July tradition: fireworks and sardines.